SpeakWrite is a reputable company that works with independent work from home transcriptionists – both general and legal – in the US and Canada. “SpeakWrite has been providing transcription services to clients since 1997. We have developed an incredible network of dedicated typists that work on a contract basis to deliver quality transcriptions to the many industries our clients serve. In order to be successful in this work from home position, it requires that you have specific tools, as well as the prerequisite experience. Before you start the evaluation process, please review the requirements as set out below. 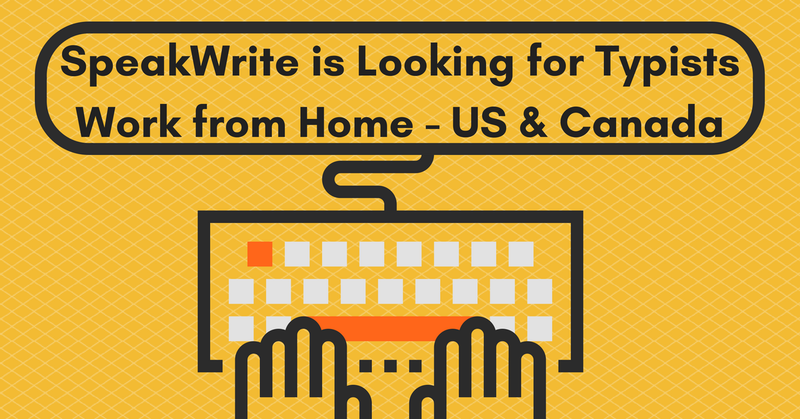 Residence: All SpeakWrite typists must be native English speakers and be residents of the US or Canada. Be able to type at least 60 words per minute with 90% or better accuracy. Have specific experience in and good working knowledge in the creation of formal correspondence, memos, reports, etc. Have a good working knowledge of English grammar, spelling, and punctuation. Be proficient in Microsoft Word 2007/2010, including advanced formatting features. Possess a minimum of 24 months of increasingly responsible transcription or word processing experience in the legal field, within the last five years. Have specific experience in and a good working knowledge in the creation of legal pleadings, agreements, court headings, interrogatories, deposition summaries, formal correspondence, etc. Have a good working knowledge of the proper format of legal citations. Sound card and earphones to listen to the dictation. Foot Pedal – As a SpeakWrite typist you will need a foot pedal to operate the playback of dictated material. A reliable internet connection with similar or greater bandwidth as a DSL connection. Note: SpeakWrite software is not compatible with the MAC operating system. All typists must conduct their work on a Windows machine (not Windows 10 compatible). Click here to learn more and to apply. For more jobs like these, check our Newest Jobs & Gigs page. To be the first to hear about jobs like these, like our Facebook page. Good luck in your next steps toward working from home! This entry was posted in Independent Contractors, Transcriptionists (Non-medical), Work at Home Jobs and tagged SpeakWrite. Bookmark the permalink. ← New Openings! : U-Haul Now Hiring Part-Time CUSTOMER SERVICE AGENTS!